The highlight of my trip to Kansas City was the 32oz. Porterhouse at Anton's Taproom on Main Street. ...UNLESS YOU AVOID THE BAD AIRPORT, BAD BBQ AND BAD RESTAURANTS WITH BIG REPUTATIONS AND FADED TALENT. BUT READ HOW ONE GREAT RESTAURANT SAVED THE TRIP. By Eric Peterson, PillartoPost.org Dining Critic--Kansas City is known for its food, jazz, and a thriving arts scene, but it deserves one black mark of shame: its airport is one of the worst I’ve ever seen. Kansas City is known for its food, jazz, and a thriving arts scene, but it deserves one black mark of shame: its airport is one of the worst I’ve ever seen. The cramped gates, the unusually large population of the lobotomized shuffling through the constricted terminal, the sluggardly, shamefully disorganized baggage-claim system—it’s enough to make a seasoned traveler load up on solid-lead fishing sinker weights and go in search of the nearest mill pond. As for the frequency of the airport’s rental car shuttles and their malicious drivers, I’ve never seen such foot-dragging. Cattle are treated more expeditiously—and arrive at the slaughterhouse in a better mood. Another thing about Kansas City: I’m not one to genuflect at the altar of barbecue. Going to Kansas City and eating barbecue is like going to the Stanford Library and checking out a Stieg Larsson book. You can do it, but with so many more interesting choices, why would you? Too many so-called BBQ palaces simply offer inferior cuts of meat, baked beans, french fries, cole slaw and potato salad—a fare more geared to satisfying the appetites of a pack of wild dogs than the palates of those with a semblance of good taste. And in most barbecue joints, the ambiance matches the superficial food: sticky floors, dirty tables, long lines. The kitchens are manned by miscreants who, with their prison tattoos and covered heads, I suspect are ex-cons on parole. The drill for ordering food is as undignified as it is inflexible. With short tempers and menacing scowls, the employees at the cash registers demand your order in the same tone of voice with which they might demand, some hours later in a darkened alley and in the company of their cooks, your Rolex. Incidentally, certain Southern California barbecue chains have doubled down on the ignominious, stand-in-line approach to getting food, making the process even more undignified for the customer: they issue electronic red buzzers that, when the eats are ready, trigger off a sequence of noise, flashing lights, and pulsations that threaten the customer with electric shock and could quite possibly lead to convulsions. This Cranky Diner is still trying to calculate the degree of self-loathing a restaurant patron must harbor in order to voluntarily accept a red buzzer from a perfect stranger and then to stand shoulder-to-shoulder with other suckers in the lobby of a third-rate restaurant, waiting for his turn to eat, sometimes for more than an hour. You’d see me dead first. But back to Kansas City: Lest you think I am anything but a fan of this Paris to the Plains, let me here and forever set you straight. My reward for navigating through the nightmarish airport was Kansas City itself, a remarkably clean, friendly, all-around welcoming place, where even the homeless hold doors for ladies who happen to be passing by. The gentlemen of the grass happily volunteer directions for lost tourists, too—gratuities not included. My wife, Teresa, and I eventually got our rental car and checked in to the Sheraton Kansas City at Crown Center, a high-rise hotel in the heart of the city, mere blocks from historic Union Station. Our view of the Kansas City train yards was magnificent. Soon we were off to dinner. I am a sucker for old mahogany paneled steak houses, and in the fashionable and upscale Country Club Plaza, a short Uber ride away, there was a celebrated chophouse that has been in operation—and family owned—for four decades. At the Plaza, Teresa and I alighted from our ride. The tree-lined street was surrounded by trendy, open-air restaurants bustling with exhilarated diners. We entered our acclaimed steak house and found it … empty. It was like being in the presence of a legendary, elderly monarch lying on a bed of woe, clinging to life, while the world outside carries merrily on. The vacant bar, the silent dining room, the skeleton staff holding things together as best they could, the novice server grimly going through the rote of presenting the night’s specials—it pointed sadly to the imminent demise of this venerable establishment. Based on the food, I’d recommend posting a Do Not Resuscitate order on the back of the menu. The oysters Rockefeller was banal and uninspiring. They offered it in servings of four. Four? Whoever heard of oysters Rockefeller served in four? My New York steak was puny. It looked like something I might’ve had 40 years ago at Sizzler, while on a high school dinner date. The sautéed spinach was so dry that it constituted a fire hazard. I won’t mention this steak house by name, but you’ll read it soon enough in the obituaries. 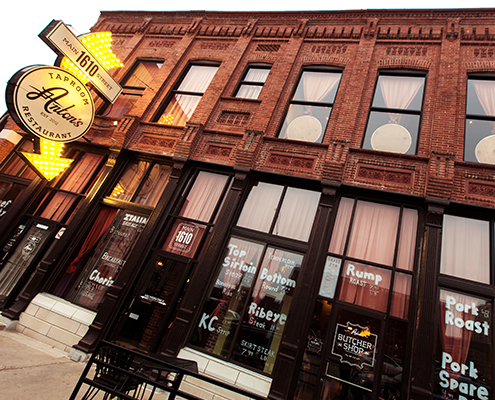 It was here in Kansas City, on this very same trip, that I had one of the most memorable meals of my life. 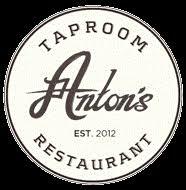 Anton’s Taproom Restaurant appears to be a hole in the wall. 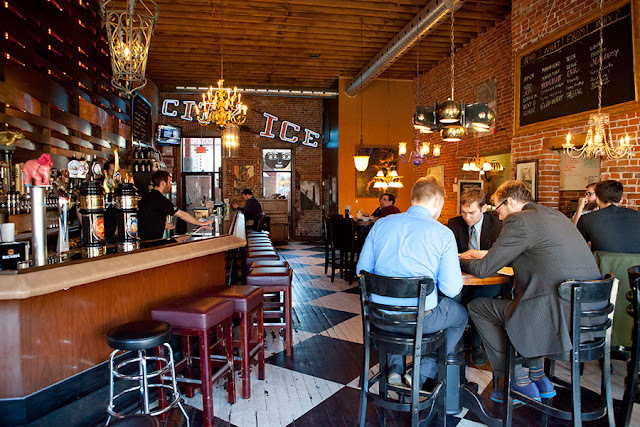 You’ll find it at 1610 Main Street, in an unassuming structure in the heart of the Kansas City Crossroads Arts District. At the behest of Jerry, the restaurant’s middle-aged, good-humored ambassador-manager who doubled as our server, Teresa and I split a 32-ounce, cut-to-order, dry-aged, grass-fed, antibiotic-free porterhouse steak. It had the texture of sashimi—and was hands down the best, the most flavorful beef I have ever tasted. Jerry talked us into the charcuterie starter—a good choice for a restaurant that has a retail meat market on the premises and makes its own salumi, prosciutto, and pork rillettes. At Jerry’s urging, we also started with an order of roasted bone marrow. We scooped the bone marrow and residual fat onto pieces of crusty bread. The beef bones, nearly as long and thick as police batons, came with smoked brisket sausage on the side. This extravagant lunch cost a pretty penny—with daughter Katie, and her husband, Lucas, there were four of us. On our way out the door, Jerry told us about a signature cocktail called the Bone Marrow Luge—a shot of whiskey sucked through the hollow of a beef marrow bone. Wide-eyed, I looked at Lucas, and Lucas looked at me. There wasn’t time; after this long lunch we had a Royals-Indians game to catch, but you can bet we’ll beat a path back to Anton’s the next time we’re in Kansas City.